Hello, and welcome to my personal review of photographic highlights of 2016. This part 1 covers January to June and all aspects - rail, bus and air - but hopefully with something to interest everyone. I have not covered all newsworthy happenings by any means, but have seen some interesting workings and a couple of unique and unusual items over the year; but I hope the collection gives a feel for the year - both the ordinary, and the less usual. Obviously these are only a small selection of the shots uploaded over the year. These pages are arranged so that if you click on one of the images, the gallery it is from will open up. In most cases, this will cover the day and category - eg the first image will open a gallery of bus photographs from 9th January. Enjoy the pictures - and feel free to comment on any of my feeds (Facebook, Twitter or E-Mail) if you have any comment or queries. The month started with a trip to Nottingham to see family and friends over there. Most shots are therefore from that trip, including a preserved bus depot open day as well as public transport in the city. Post New Year, a trip was made to the UK to visit relatives not seen over the Christmas period. 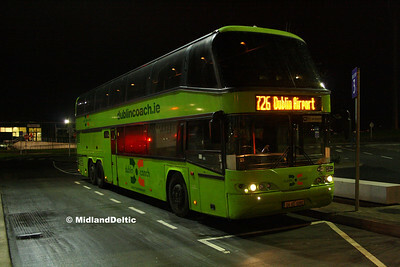 Rather than park the car for a week, we chose to use the 24 hour Dublin Coach service to the airport. Quite well used even with an 2330 departure! At Red Cow, a vehicle change was scheduled, so the chance was taken to get a night shot of our replacement vehcie, on which we were the sole occupants for the spin along the M50 to the Airport! 04-KE-11340 waits in the dark at 0108 on 9th January to resume the 2330 from Portlaoise. Flying from Dublin to East Midlands briefly had a choice of operators at this time, but Ryanair always won on price, and Aer Lingus Regional have now dropped the route. The only issue is the flight times, as they appear to be shoved in at the start and end of the day as a "filler"! Having arrived as FR535 from EMA, EI-DAN is prepared for the return FR534 on 9th January. 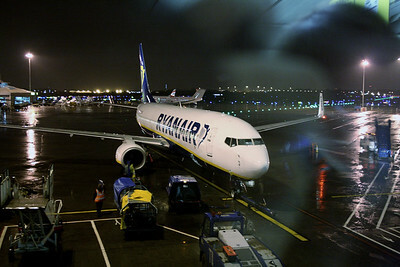 Quite a venerable aircraft for Ryanair, it was delivered in the September 2003. Our visit to the UK fortunately - and coincidentally (honest, Guv!) - allowed us to visit a Nottingham Heritage Vehicles open day at their premises in the former Trent bus garage in Hucknall on 10th January. The highlight was the launching of the restored Scania Artic, formerly of Nottingham City Transport. You know you're getting old when you remember now preserved buses entering service! Never really a success at NCT, as the kerbside space taken up interfered with bus stop layouts, especially after the cramming of services onto city roads with the tram-inspired changes to Old Market Square, these spent most of their latter years on the shuttle between university campuses where this issue was less apparent. This is the only operational survivor - another is a static classroom I believe. It is seen on its second run in preservation. Love them or loathe them, the Nottingham Standards were certainly distinctive, and extremely practical. 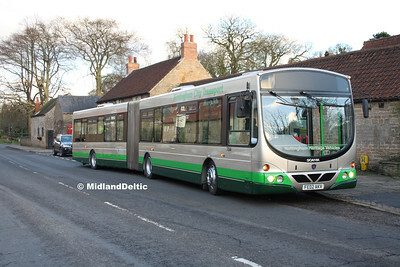 Here we see OTO540M, the first of a batch which was destined to displace the AEC Renowns from the core routes between Bulwell and Trent Bridge, on a demonstration run at Linby. The design was almost perfected at this stage; however, following batches incresed the seating from 77 to 78 and finally 80, all in a two door 9.5m bus - a far cry from todays 65 seats that London get into a 12m dual door these days! Nottingham station has changed quite drastically since my youthful spotting days! The most recent changes are new new station entrance, tram interchange and car park complex on the south side, the removal of vehicle access from the station front and of course major changes to the rail network through the station, with the removal of the through roads and replacement with an additional platform. This is a long way from the entrance, and somewhat exposed - perhaps that is why minority operator Northern gets put there! 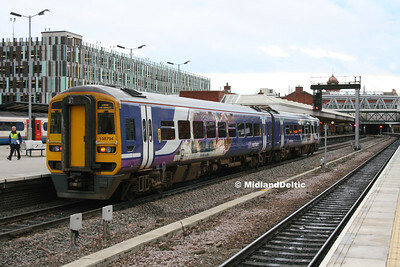 158794 is seen with a Leeds service on 12th January at what is now platform 4, in one of the vinyl wraps advertising attractions in their area. A now historic shot. 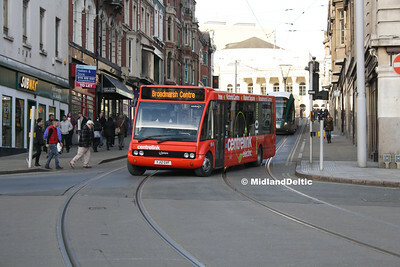 Wellglade, through their Barton Buses subsidiary, have operated Nottingham City Councils Centrelink service for some years using four electric Solos. During the year, they lost the contract to Nottingham Community Transport, who are now using more modern electric Solo SRs. 998 Is seen turning off Market Street onto Angel Row on the 16th - a move which is totally alien to those of us who grew up in the city in the 1970s! 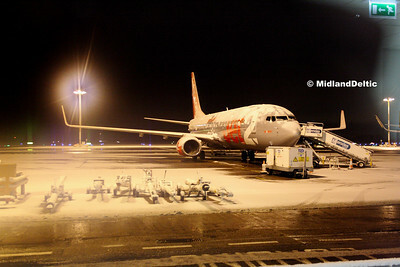 The night before our flight home, a light snowfall occured. It was however heavy enough to cause serious issues for the first group of flights out of EMA, with apparently one de-icing crew on duty to service three aircraft due out within a short period. Needless to say, delays ensued; with our flight to Dublin delayed after boarding by nearly an hour while the crews cleared the aircraft. Here we see Jet2 737 G-JZHB waiting for passengers heading for sunnier climes on the 17th. Back to normal! 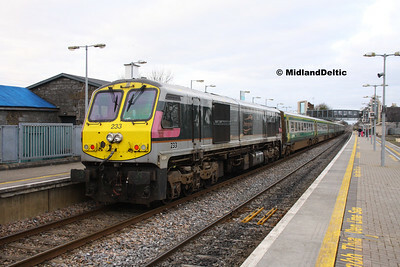 219 is seen powering away from Portlaoise with the 0900 Heuston - Cork. The location is by the motorway junction south west of the town; the map indicates it as being Clonboyne, but many use Clonkeen, the name of the former crossing about ¼ mile west of here. 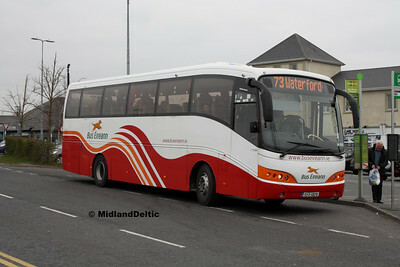 I didn't stray too far this month, so shots are from the Portlaoise area - with a symbolic last VG appearance on the 73. The slow pace of the Enterprise refurbishment project led to spare locos working on the Cork line. Here we see 233, the last in an old Enterprise livery, heading south at Rosskelton on the 0900 Heuston - Cork on the 2nd February. The low sun helped this shot! 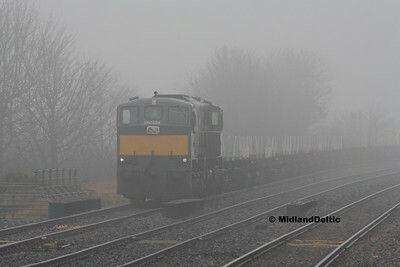 The mist dropped, but gives an atmospheric view of 088 as it waits in Portlaoise station loop with the delayed 0930 Portlaoise - Waterford empty steel train on 12th February. 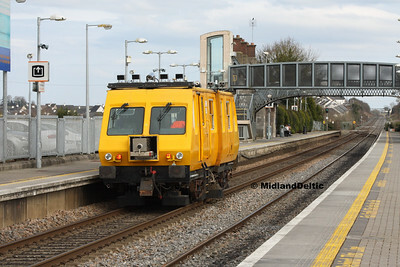 This working is semi-regular, bring imported rails from the port to Portlaoise Rail depot, but timekeeping is not always a strong point, and the working can often be cancelled at short notice. The Sperry rail measurement train runs at least once a year over the whole network, analysing the rails and giving pointers to where remedial work is needed. 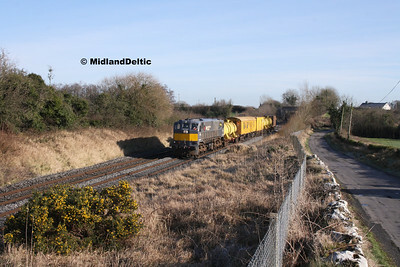 088 is seen with the set at Rosskelton, a few miles south of Portlaoise, on a sunny 15th February. 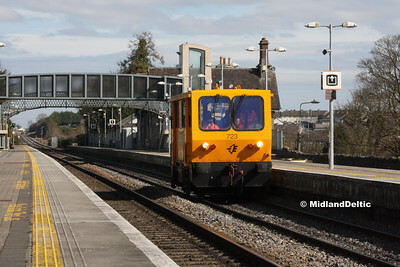 I followed the train to Ballybrophy, where it was to run round for a trip down the Nenagh branch. In particular, I wanted a shot of 3187, the former generator car now used as a control car for both the Sperry and weedspray trains, given the rumours of it's forthcoming demise. It was converted from a secondhand BR mark 1 BSK, mounted on B4 Irish gauge bogies and previously worked to provide heat and light to Cravens stock. It has be rumoured that it will be replaced by a withdrawn mark 3 generator car, but at the time of writing no progress has been made on that project. This may therefore re-appear next year! Local operator Universal PSV have a large fleet of mini and midibuses for use on schools and other contract work, but also maintain a few full-sized coaches. 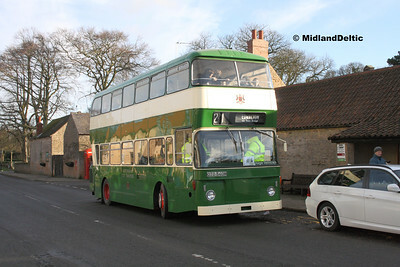 This new arrival was seen being prepared for service on 16th February, prior to being re-registered 07-LS-6198. It is a Sunsundegui bodied Volvo B12B. An "end of an era" shot. 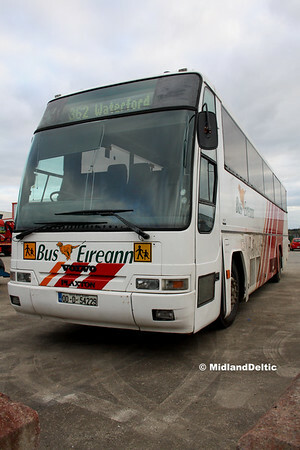 Athlone based VGs (especially VG8) were regulars on the 73 to Waterford, but their mass withdrawal meant they were replaced largely by SCs - although other vehicles frequently appeared! This was a lucky shot - the road into Portlaoise from Mountmellick was closed, and the diversion took the traffic past my house. I happened to see the VG, so jumped in the car and followed it, catching up with it during its scheduled 10 minute stop at Stradbally. As a bonus, it wasn't VG8! 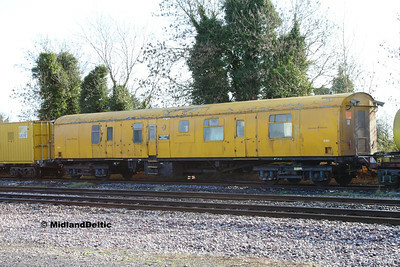 VG4 is seen at Stradbally on 19th February. 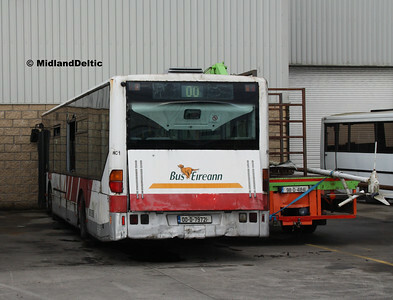 The arrival of long-stored Bus Éireann MC Class buses at Universal PSV, visitors to Corcorans for maintenance and an old livery hanging on in service! 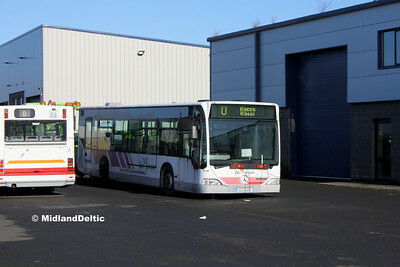 The big bus news was the arrival of several long-stored Bus Éireann MC Class Citaros from both Galway and Limerick at Universal PSV for spares / repairs. Not in the best condition (to put it mildly! ), they all arrived on suspended tow. The former MC18 (00-D-93655) is seen in the yard after arrival. At the year end, I believe they were all still here; some undercover having had some work done, others untouched. 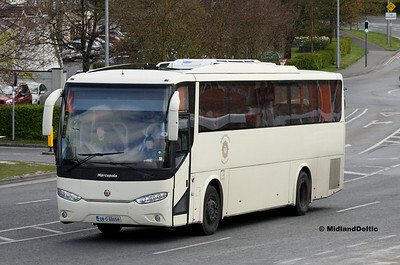 Corcorans in Portlaoise undertake work for both Semi-State operators as well as private companies. This can lead to some unusual visitors! 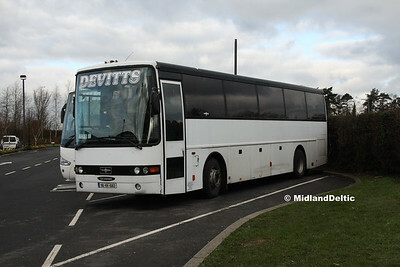 Here we see VP319, relegated to Schools work but still going strong, at the premises on the 12th. 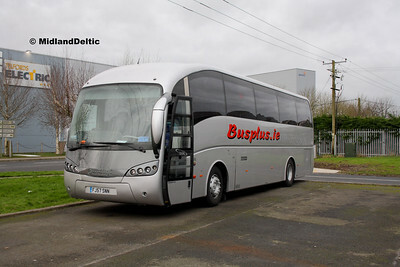 Another visitor in Corcorans on the 12th was Dublin Bus GT35. Double deckers are not unusual in Portlaoise, as Dublin Coach use Neoplan Skyliners, but urban service deckers are somewhat rare! And still it kept going! The old Enterprise liveried continued in evidence on the Cork line on the 12th, with 233 propelling the 1520 Cork - Heuston. Additional interest is garnered with PW and CE workings. The base for such machins is Kildare, with PW yard at Portlaoise and the recently expanded yard at Portarlington generating workings. 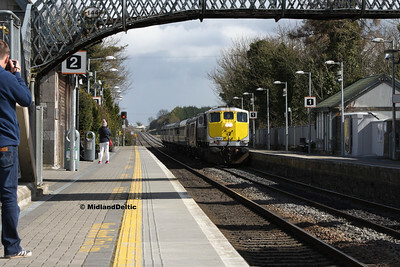 Here we see 723 pass Portlaoise on the 15th, with a Dublin - Ballybrophy working. The 15th was a good day for test workings! 700 is seen passing north a little while later with a Mallow - Heuston working. Pathing of these trains can be an issue, with limited top speeds. While south of Portlaoise is not too difficult, from here to Dublin the service intensity increases. Due to the nature of testing, is can also be necessary to use the fast lines east of Hazelhatch, so no relief there either! While the 73 is quite a standard route most of the time, with an allocated vehicle (SC246 at the time of this photo), oddities can appear. Usually these are SPs casceded from Expressway work in Galway, but on this occasion an ultra-rare VC309 appeared. 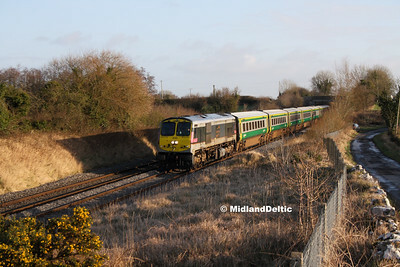 Dressed in the latest livery, the coach looks very smart as it picks up on the 0910 Athlone - Waterford working. Standard fare on the 24 daily hourly departures on this commercial route to Dublin Airport are these Neoplan Skyliners of Dublin Coach. These vehicles have had quite a hard life, as they were initially used on the Oxford Tube service between the University town and London, involving motorway work and coping with London traffic. After a period in store, there were taken on by Dublin Coach, and run this service 24/7/365, stopping only for fuel and maintenance. This route is almost as challenging, with stop start urban and inter-urban work combined with motorway running between Naas and the Airport. It has gained a bit of a reputation for poor reliability, but at the time of this photo a refreshment programme appeared to be underway, and observation suggests reliability have improved. 04-KE-11330 picks up with the 1530 to Dublin Airport on the 25th. More MC arrivals, an 071 railtour and an unusual Defence Forces coach make up a small selection from this month. The month of April started with more MCs arriving from both Galway and Limerick, including the doyen of the class. 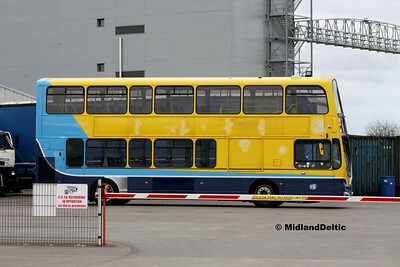 Looking as though it has seen better days, the former MC1 is seen sitting at Universal PSV on the 5th. Midway Service area at the junction of the M7 and the N77 is a regular stopping point for coaches, being between 1 and 2 hours from Cork, Limerick and Dublin. As a result, it is often worth a visit to see if anything is in. 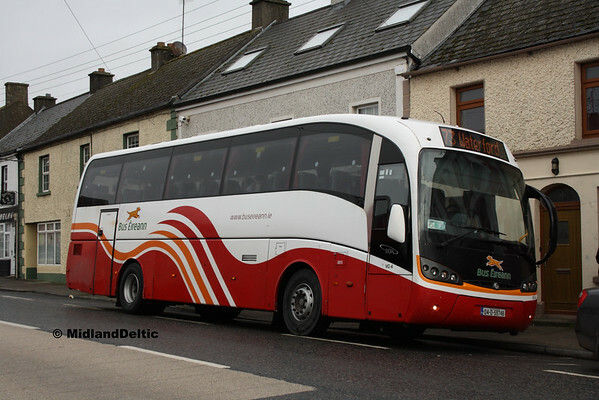 Here on 5th April we see Davitts Van Hool bodied Scania 96-KK-1663, in the company of another company vehicle, pausing for a comfort break prior to continuing on to Dublin. The newest Expressway vehicles are the the tri-axle SE class. A few are allocated to Limerick and at this time were appearing on the X12 to Dublin, as they had since new. More recently, somewhat older SPs and LCs have become the norm. 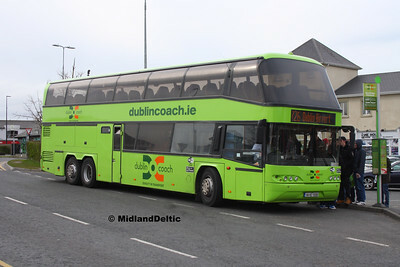 Here we see SE11 on the 0930 to Dublin Airport, which at the time was carrying branding for this service on the nearside rear window - presumably the offside rear unit has been replaced with plain glass - a remnant of the branding can be seen in the form of the diagonal stripe on the next to last window here. The IRRS traditionally run a tour in July using the Cravens stock and 071 Class locos. To celebrate 40 years since delivery, this years tour was extended to two days, with an overnight in Killarney, and covering a significant part of the network. To allow for sensible accommodation prices, the tour was switched to April; Killarney being notoriously expensive in the main tourist season! It was not originally planned to operate via Portlaoise - the original route was to Athenry, then down the Western Rail Corridor to Limerick. 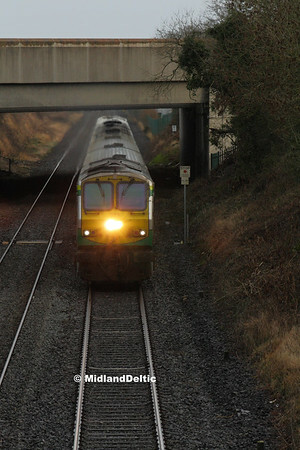 However, this line had been closed due to flooding for several months at this stage, so the route was altered to run via Ballybrophy and Nenagh. Here 083 leads the first leg to Limerick in fine weather on the 9th. At Ballybrophy, all passengers had to detrain to allow the tour to continue to Lisduff to run round, at which point the heavens opened! SC246 was noticeable by its absence during the month, and here an SP is seen on the duty on the 19th. 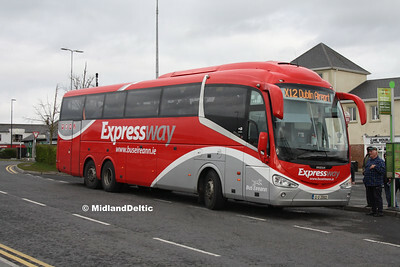 Early series SP35 was previously Galway base and used on Expressway services, but has been replaced by new SE class vehicles. This particular example has received a repaint in the current PSO livery; others are in the remnants of their previous branding. 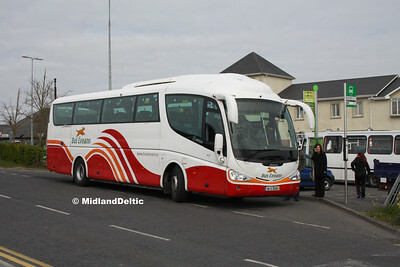 An unusual visitor at the end of the month was this Ógliagh na hÉireann Marcopolo bodied coach. Given the nature of the vehicle, no further details are forthcoming from my usual sources, although it may by on a DAF/VDL chassis. 08-D-60056 passes through Portlaoise on the 26th.